First Published: In English in 1929, The Militant. Source: The Third International After Lenin 1929, New York. Translated: 1st version unknown translator in Russia, US edition, Max Shachtman. Transcription/HTML Markup: Sally Ryan, 1997, subsequent HTML updating by David Walters, 2003. Copyleft: Leon Trotsky Internet Archive (www.marxists.org) 2002, 2003. Permission is granted to copy and/or distribute this document under the terms of the GNU Free Documentation License. Leon Trotsky wrote the two documents that comprise The Third International After Lenin in 1928, while involuntarily exiled in Alma Ata. The documents were meant to be used for discussion at the Sixth World Congress of the Communist International. Trotsky’s work – a sharp criticism against the opposing program supporting “socialism in one country” – was never distributed to or discussed by the main body at the Congress. The parts of it made available to a committee, but then recalled, were smuggled out of the country by James Cannon, a delegate and founding member of the Communist Party in the United States. Cannon – subsequently expelled from the CP – and his supporters formed a Trotskyist organization Communist League and first published his smuggled sections in their newspaper, The Militant. Shortly thereafter, it was published in book form. In the introduction to the first edition, (1929) Cannon wrote, “The publication of this masterpiece of Bolshevik literature, written by the foremost living leader of world communism at the height of his powers, is a revolutionary event of great importance ...”. 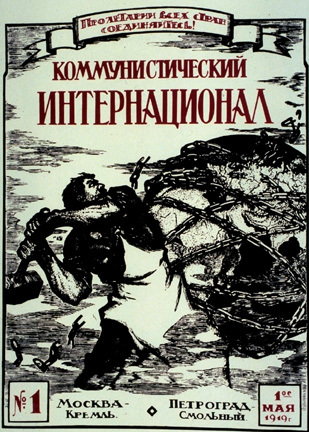 The on-line version of The Third International After Lenin – “The Draft Program of the Communist International: A Criticism of Fundamentals” and Trotsky’s letter What Now – has been divided into fourteen sections of approximately equal length. or a Program of Socialism in One Country? 6. Where is the “Social Democratic Deviation”? 3. Democratic Dictatorship or a Dictatorship of the Proletariat? 2. Why Has No Congress of the Comintern Been Convoked for More Than Four Years? 7. A Maneuver or a New Course?